Whilst the product inside the bottle is great, we find that the spray mechanism is not of the best quality and they often become loose and/or leak. Does the spray contain alcohol? I can confirm that this product does not contain alcohol. 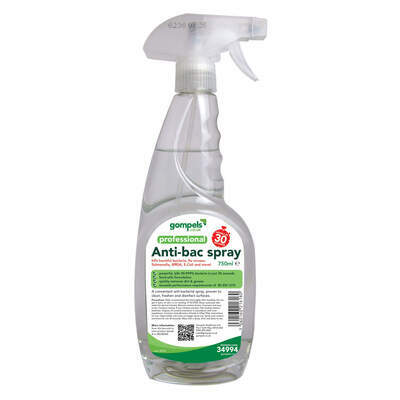 As part of our own branded range, this Gompels Antibacterial Spray offers powerful performance with a budget-friendly price. It has been specially formulated to leave your surfaces hygienically clean and safe. This makes it ideal for use in all work environments including offices, nurseries or care homes. It has been carefully formulated to leave behind no taint or smell on surfaces - making it food safe and perfect for catering businesses. Here, this antibacterial spray is provided in an economical pack of 6 which can be distributed out within your janitorial team or stored until required. The trigger spray tops provided are of good quality and are designed to last. Keep the risk of infection to a minimum with our range of Infection Control products today.